Academic Learning Services provides a range of resources to assist you with your learning and study. Develop your writing and study skills by using the guides provided. 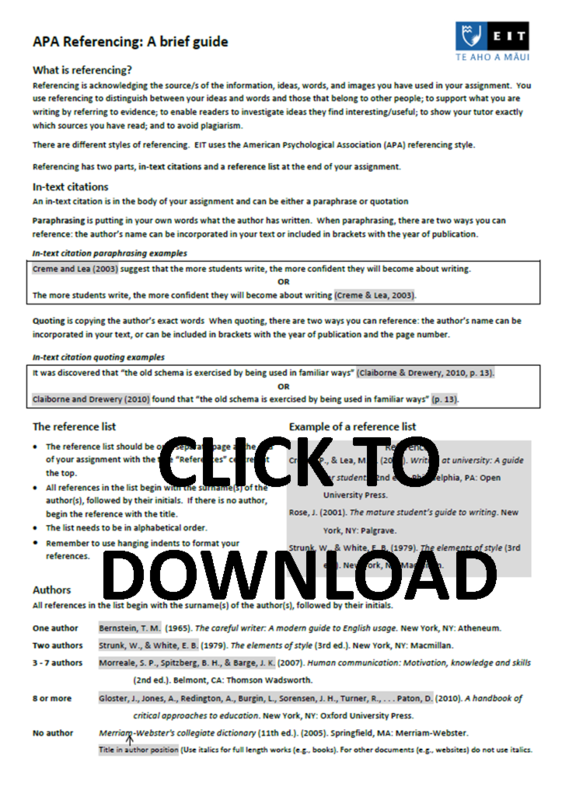 Resources that will help you write your assignments and become familiar with academic words. Resources that will help you with APA referencing, academic integrity and the use of Turnitin at EIT. Guides to the correct APA Style and how to format your assignments. Resources that will help you improve the way you write and improve your language skills. Guides to help you locate and evaluate information. Resources to help you study online, use the EIT computing resources, and format your assignments. Guides for specific EIT programmes. Resources to help you improve your numeracy. Advisors are available for group or individual appointments on the EIT campuses and Regional Learning Centres.